BioWare really wants fan participation in the upcoming Mass Effect sequel. No doubt they are playing it safe after the firestorm of bad press about the ending to their first Mass Effect trilogy, which is quite a shame because that would put BioWare in the same category as ever other AAA developer who plays it safe these days. But how safe is too safe? Seriously, this question BioWare is asking fans is a little frightening. 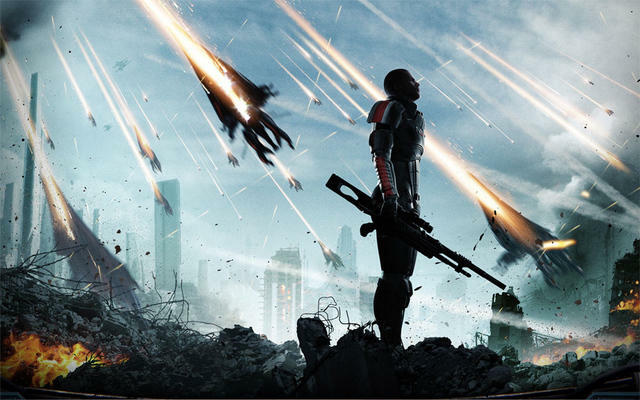 BioWare's Casey Hudson is asking through Twitter whether or not they want Mass Effect 4 to be a sequel or a prequel. BioWare has already confirmed that Shepard will not be the hero of their upcoming game, but how much would we really need to backtrack the history of Mass Effect before his/her arrival on the galactic scene? We already have three games with layers of exposition spelling out every huge event that has shaped this fictional universe into what it is today. Prequels and origin stories now dominate our entertainment industry, from comics to movies and especially video games. This is because they are so easy to write, a lazy excuse for filler when writers can't come up with new ideas and want to retell old ones. Why bother going back and playing events we already know happened when the clean slate left at the end of Mass Effect 3 has unlimited possibilities for the future? Not to mention all of our favorite characters have been either killed off or wrapped up entirely. There is only one direction for this series, and that is forward. Any back story ideas not explored in the first three games can be just as easily added as exposition this time around too. Unless they have the ability to something totally out of left field like Metal Gear Solid 3, which most AAA publishers don't have the stomach for anymore, leave the past alone. Where do you stand on BioWare's question? Should Mass Effect push its setting forward a couple years, decades, centuries, or should it move back in time to retell important events or retcon everything we know up until this point?